The kitchen is often thought of as the heart and soul of a home. Often a “meeting room” for families- whether that be in the morning over breakfast or sharing the day’s events as an evening meal is prepared. Kitchen floors take some heavy duty wear. From boots and shoes, animals, food spillages and frequent mopping, all contribute to testing the durability of whichever type of flooring is chosen. The kitchen is commonly the first room to have a makeover and, generally, a lot of financial investment tends to go into the kitchen. 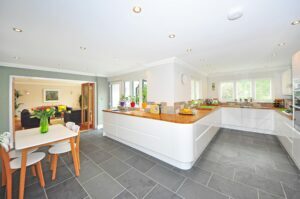 When planning the kitchen, time should be taken into considering the floor too. The floor can be as much of a feature as the worktops and cupboards as well as being functional and ready for everyday use. And if a tiled floor is required, what is the most durable tile for a kitchen? Porcelain Tiles – Porcelain tiles are widely championed as the toughest tiles and are likely to withstand the treatment dished out to them in a kitchen. Fired at high temperatures, porcelain tiles are strong. Colour is added to porcelain tiles during the glazing process and this colour will remain for the lifetime of the tiles. Almost completely resistant to water penetration, porcelain tiles are certainly a tough choice of kitchen flooring. How to choose the best kitchen tiles – a well prepared kitchen floor with expertly laid tiles can give the wow factor to any home. Porcelain tiles aren’t the only tile option, other materials should be considered before making a final choice. Ceramic tiles are easier to install than porcelain but are more porous and will need periodic treating to maintain the glazed finish. Stone floor tiles are great for a more ‘real’ finish. Careful cutting and laying of the textured finish of stone can give spectacular results.This floor will require regular maintenance. Marble tiles offer a sleek, elegant look, perfect for a contemporary kitchen design. Highly polished marble can really grab attention as its vibrant colours stand out. There may be practicality issues as marble can be extremely slippery when wet and in some cases even when it is dry. Sandstone, granite, quartzite and even glass are other tiling options. Whatever style of kitchen tile is chosen, the floor should only be laid on a perfectly prepared base which has allowed for the weight the tiles are adding to the floor. Precision cutting equipment is essential to avoid unsightly ‘nibbled’ edges to any cut tiles. While there are other types of flooring available for kitchens (real wood, wood effect vinyls, wooden tiles, click together flooring), tiles, whichever style is chosen, are generally considered to be the best option. They will last longer and with proper care and maintenance will maintain their appearance throughout their life. Damage to a tile can be fixed by replacing a single tile as opposed to a locked together or one piece flooring system. If the look of wood really is the only choice, why not use porcelain faux wood tiles? If you would like to learn how to tile a kitchen floor and some more information about why tiles are best for kitchen floors, then contact us at UK Pro Tiling Training.